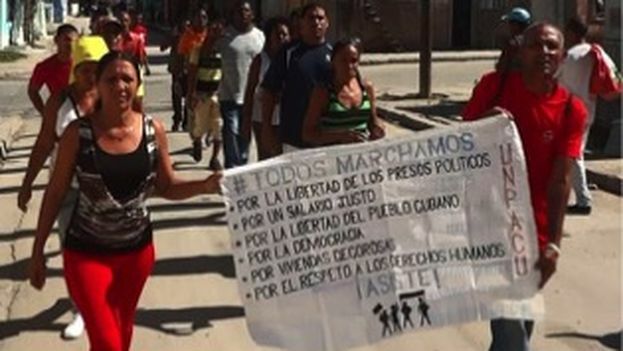 14ymedio, Havana, 28 May 2016 – This week has been one of surprises for several activists from the Patriotic Union of Cuba (UNPACU) who denounce that they have been victims of a raid on their homes and the confiscation of their belongings. The dissidents detailed that the political police raided three houses in the city of Santiago de Cuba on Saturday morning and a fourth in Havana on Wednesday. In a telephone conversation with 14ymedio, Yusmila Reyna said that at six in the morning, while her family was sleeping, there was a “knock on the door.” It was the police with “a search warrant for subversive activities.” An officer showed her a paper, but did not allow her to read it carefully or to take it in her hands. The incident occurred on 12th Street in the Mariana de la Torre neighborhood in Santiago de Cuba. Reyna managed to read that the order specified that they came to “seize methods of communication, money, and any other means of counterrevolution.” A total of ten uniformed officers plus two in plain clothes, who supposedly came to witness the search (Cuban law requires two civilians to witness such a search), participated in the operation. The raid lasted over an hour and ultimately they seized working notes, two laptops, an electronic tablet, two hard drives, a printer, a camera, “and even receipts for items acquired abroad,” according to Reyna. During the search of her house they also seized a number of issues of the magazine Coexistence, documents relating to the initiative Otro 18 (Another 2018)—in support of free multiparty elections—and documents relating to the Roundtable for United Democratic Action (MUAD). Meanwhile the dissident Arcelio Rafael “Chely” Molina Leyva said that Wednesday morning the police arrived to search his home, which serves as the UNPACU headquarters in Havana. “They came with several gentlemen in plainclothes and after a thorough search took three laptops, a battery to recharge cell phones, two mobile phones, office supplies, news from international agencies, printed civic material and digital backups,” Chely enumerated. This is the fourth search of this nature by the political police on UNPACU’s Havana headquarters. As a part of the operation they arrested Carlos Amel Oliva Torres, who despite having a temporary residence permit for Havana was taken to the third station of the National Revolutionary Police (PNR) in Santiago de Cuba, where he is still under arrest.